While roaming through retirement, we miss the harsh winters, thanks to Ajijic Mexico, but get to experience springs, summers and autumns here in the USA. 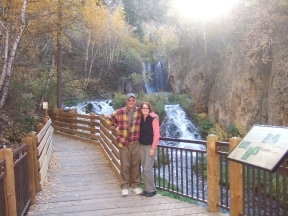 Here we are in Spearfish Canyon South Dakota on a three week RV road trip from the Dakotas to California that spanned September and October. Hope you enjoy the journey with us. September started where August left off, in Minnesota with our daughter Denise and her family. Here Grandma Glorine and Chase are learning the intricacies of words and pictures from Clara. 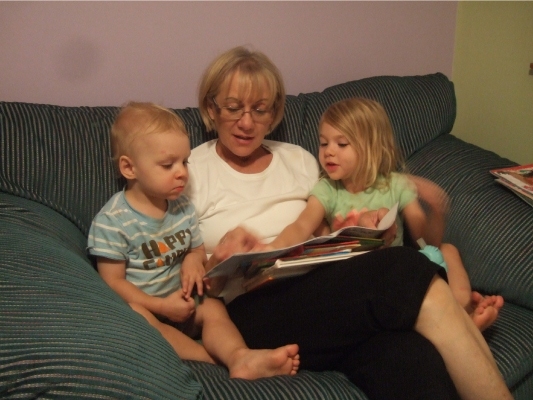 These kids love books and one of the joys we have is reading to them. 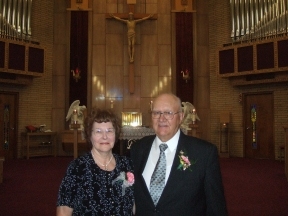 Labor Day had an extended purpose this year--celebrating Larry's brother Jack and Maryann's 50th wedding anniversary in Bismarck/Mandan, North Dakota. While some anniversaries last a few hours, this one lasted three days with friends and family coming in from all over the Midwest. Included in the celebration were most of Jack's siblings--from left to right are LARRY and Glorine, LORRAINE (Larry's twin sister) and her husband Frank, the guests of honor, MaryAnn and JACK, LILLIAN (the matriarch of the family) and BOB and Francie (who just celebrated their 50th wedding anniversary in June). Missing are Pete (who passed away in 1983) and Claudia who lives in Oregon). 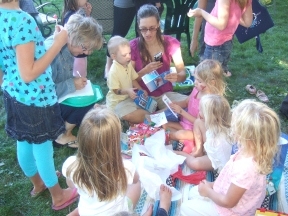 The celebration started Friday evening at Jack's son Randy's place with a great cook out and storytelling around the campfire, all day Saturday, it culminated with a Mass, reception and picnic on Sunday. 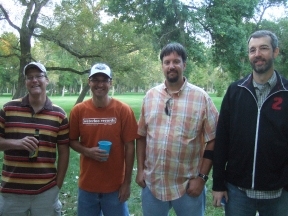 Here are some of the Barnhardt boys--Greg (Jack's oldest), Rick (Pete's son) and Alan and Rob (Bob's sons). Rick and Al are two of Larry's five God sons. After the anniversary, we traveled back to Minnesota to celebrated Chase's birthday. 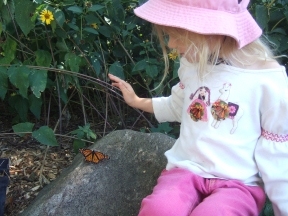 While we were there, Minnesota had the Monarch Butterfly Festival recognizing the two thousand mile migration to their winter home in Mexico. Here Clara is playing with one of these beautiful creatures. Can you imagine this boy is two years old. 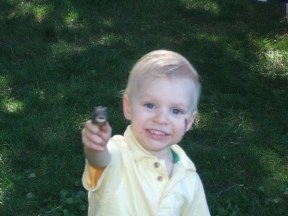 We can no longer call him Baby Chase. 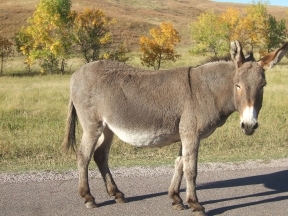 It is one of many nick names he will grow into and out of as he moves into adolescence and adulthood. We can't blink, because that time will be sooner than we like. 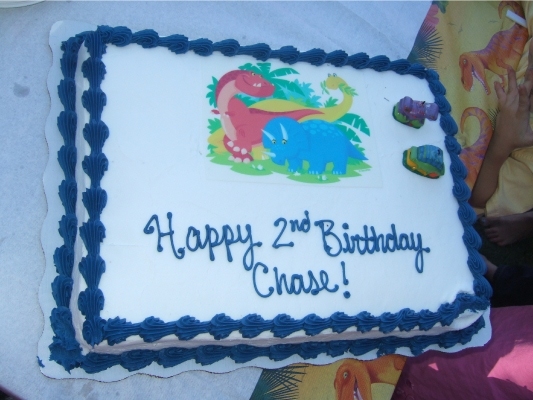 In mid-September chase celebrated his second birthday in the back yard of his parents' home on Prior Lake. Lots of games and a unique boat ride where all the kids went to a deserted beach to conduct an archaeological dig trying to find the bone of prehistoric dinosaurs. They did!! Chase's turn with the bat or should we say his turn to swing at a candy loaded dinosaur looking pinata. 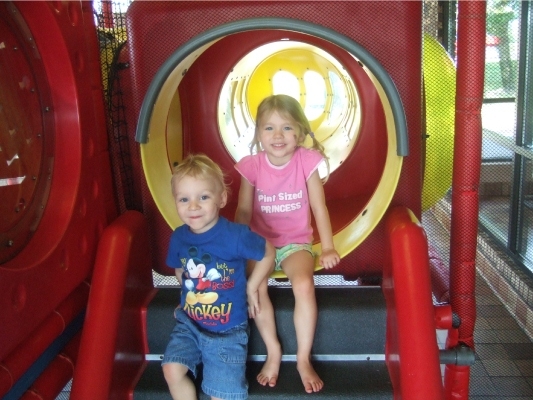 This event has become a tradition at both Clara and Chase's birthdays and the kids love it. 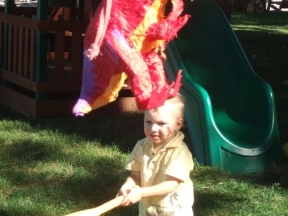 Especially those who dive in for the candies as the pinata is finally cracked open. Presents are always welcomed, but Chase was too consumed with the first present he opened, which were little cars, that he thought playing with them would be more fun than opening other presents. Notice Clara getting in the act as the assistant gift opener. It was a warm, sunny and fun filled day. Early autumn brings on another ritual at Denise's place and that is apple picking. 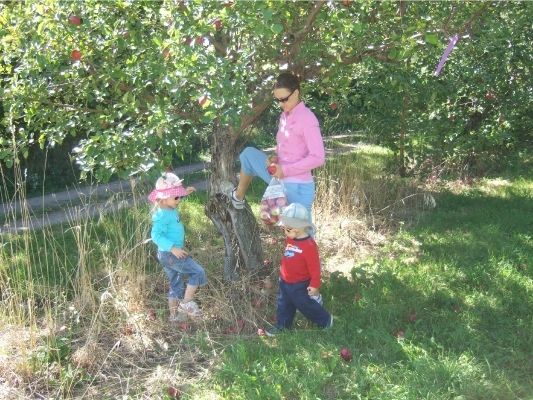 There are several apple orchards to choose from within a 10 mile radius of their home. And the variety of apples are unbelievable. We sampled a few at the store and then went on an apple hunt to find the ones we liked best. Yum! Babysitting does not come round that often because both of our daughters have full time day care providers. 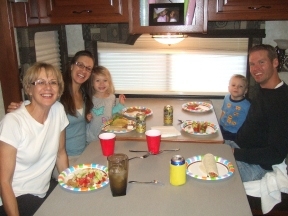 But on one occasion, Denise's sitter took a vacation day and we got to spend the whole day with Clara and Chase. Here is one of their favorite spots--Playland at McDonalds. Clara ate four hash brown potatoes. We think she likes them too much. The last supper, with Denise and family anyway. We were camped at Mystic Lake Casino, one of Minnesota's largest. It had one of the nicest RV parks we stayed at all summer. Here we extended the table with a card table so everyone had room for Grandma Glorine's fine cooking. Larry volunteered to use some of his drafting skills that he learned 40 years ago to help with the redesign of Denise and Craig's lake home. The home is a 1950s vintage home that is in dire need of remodeling. 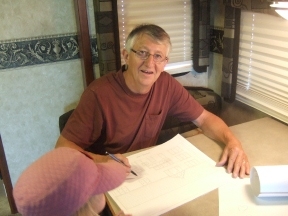 So he listened and put their ideas to paper many of the design features that they wanted. From here it goes to an architect, contractor and city hall (of course). Their tentative plans are to have the construction done during the winter of 2010-2011. 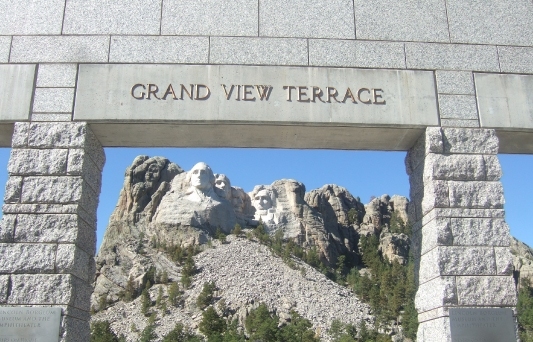 From there, we drove the RV, with Jeep in tow, to North Dakota. 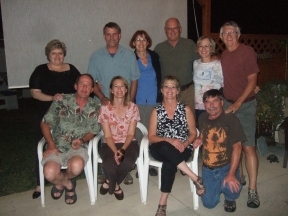 Our first stop was in nearby Winsted, MN at the home of another of Larry's God sons, Brent and his wife Barb. They have a home with several acres, so we dry docked the RV. While on the patio dining, we saw several sky divers jumping out of planes. It was an enjoyable time. 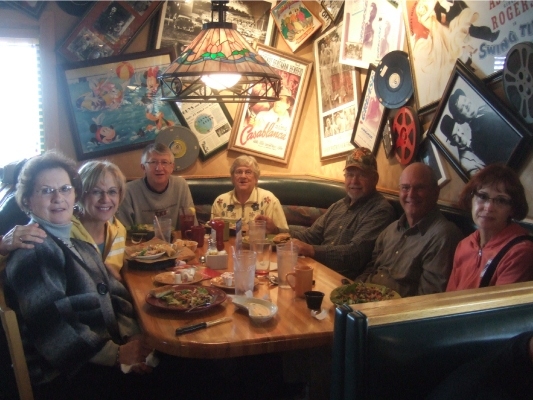 We also stopped in Fargo and saw several other nieces and nephews, but did not have our camera, but had nice visits none-the-less. 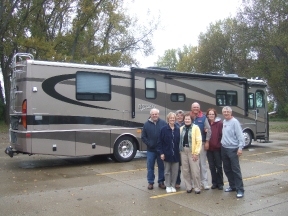 Back in Mandan, we had what has become a Ressler family tradition, an RV road trip. Along with catching up, we got to see the county side and sites we have not seen for quite a while, if at all. Glorine and Marlene are front. Ray, Ida, Wayne, Maureen and Larry are in back. 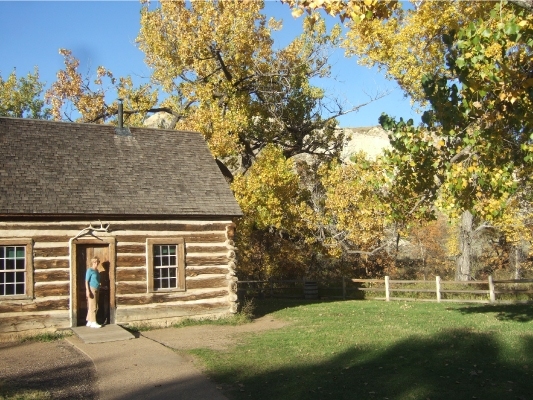 We visited Fort Mandan, which was the longest lay over for the Lewis and Clark Expedition. From there we went to Lake Sacagawea and on the way home, we drove along the coal mines and wind turbines, which along with all the oil fields, makes North Dakota so energy rich. We went to lunch with two of our winter guests in Ajijic. 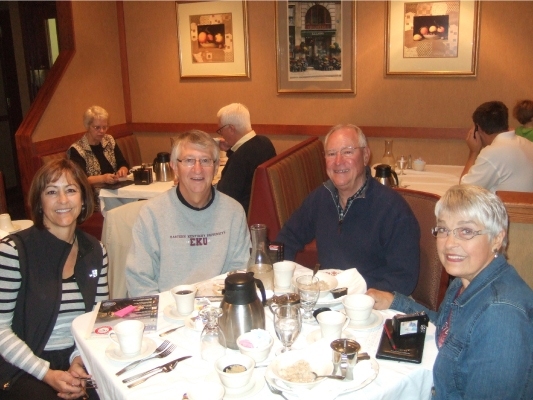 Marlene, is sitting next to Glorine and Doris, is sitting next to Larry. 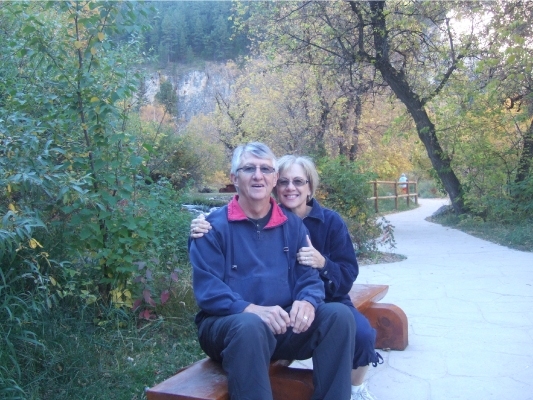 Along with Wayne and Maureen is brother Ray. Marlene is Glorine and Maureen's sister and Doris is a friend, work colleague and travel companion of Marlene's. They went on and on about how many fond memories they had of Ajijic, but more importantly all the friends we have made over the years. Muchas Gracias, Ajijic! 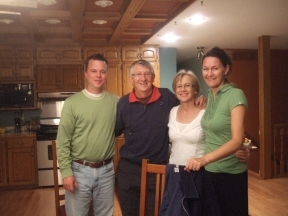 We both come from very large families, thanks to our German-Russian and Catholic heritage. 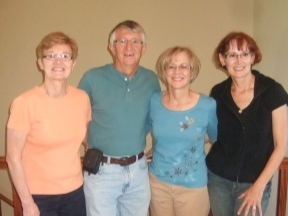 Here Larry is with one of his 116 first cousins, Tom Huff, with his wife Mary Ann and daughter Sue. 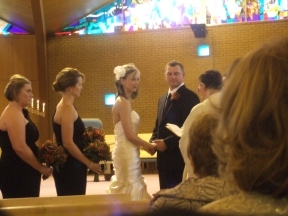 Tommy, as he is still referred to by many in North Dakota, is from the Seattle area and in town for a wedding and a visit to the "old country." With Larry being among the youngest of the cousins, many of them have long since passed on. It was nice to visit and get reacquainted. Thanks for breakfast, Tommy! Speaking of large families, Glorine has 25 nieces and nephews, with Mandy (dressed in white) the youngest. We were invited to join in on the celebration of her wedding, held in Minot. She was a very beautiful bride. 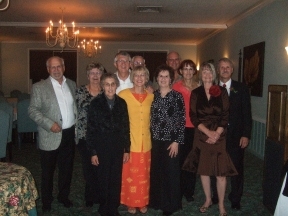 It was a grand event with a wonderful church service and an exceptional reception, dinner and dance at the country club. 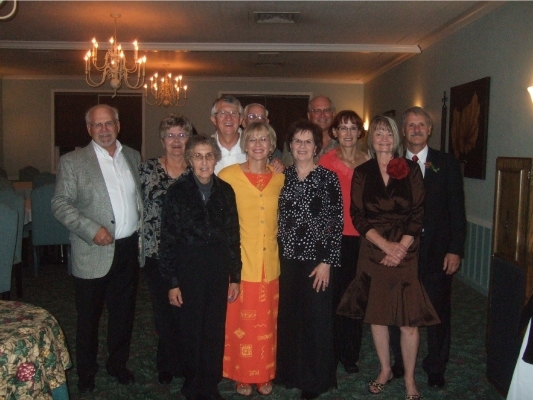 Of the ten remaining siblings, six were able to attend the wedding. 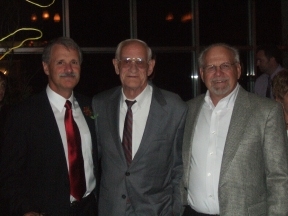 Here is Willy, father of the bride, along with brothers George and Ray. 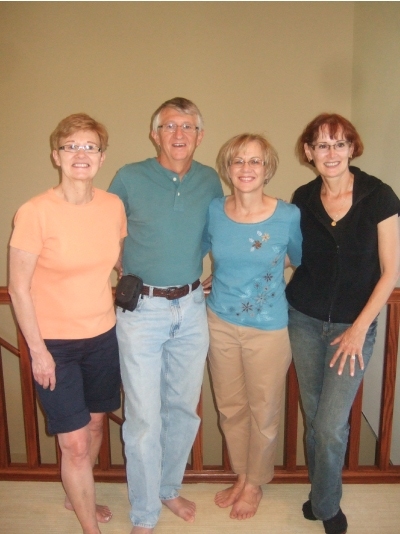 Before our drive back to Bismarck, we got this picture of the family. 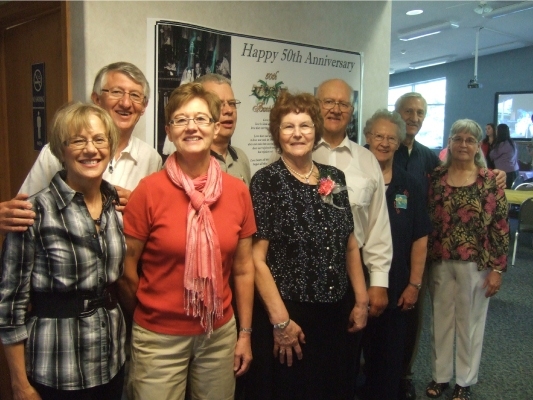 Standing right to left, WILLY and Barb, MAUREEN and Wayne, MARLENE, GLORINE and Larry, with GEORGE standing behind Glorine, Lorraine, married to EMANUAL, who was unable to attend, and Ida and RAY. After a week in North Dakota we started our three week RV road trip. 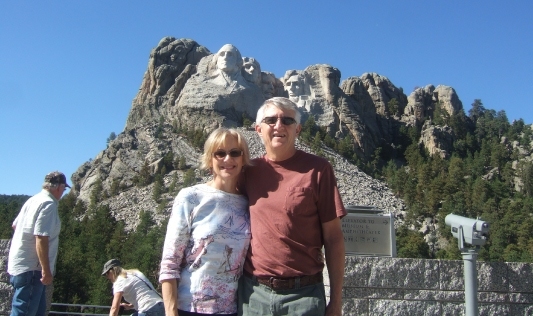 We were joined by Maureen and Wayne for 17 days that took us through seven states of natural and man-made wonders. Our first stop was in Dickinson to see Larry's twin sister Lorraine. Interestingly, Maureen was our maid of honor and Lorraine was a bridesmaid at our wedding 40+ years ago. 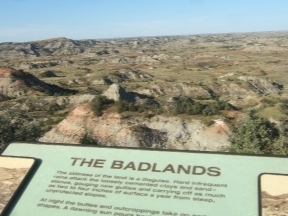 Our next stop was the Badlands of western North Dakota. This picture is the "painted canyon" known for its layers of colored soil. 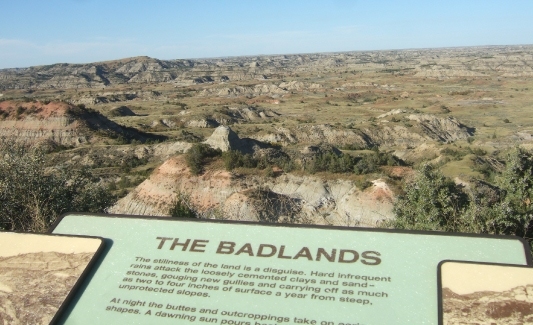 The Badlands are part of the Theodore Roosevelt National Park, which were named in his honor after having lived and explored the area in the 1880s. 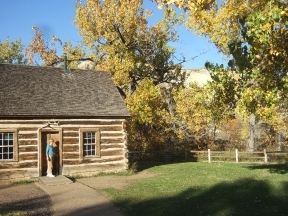 Here, Glorine is standing by a replica of the house he lived in at the time. 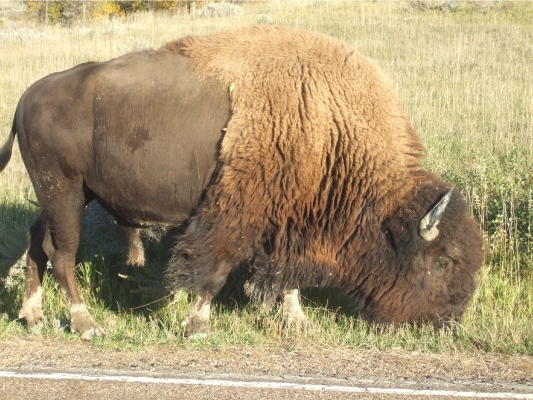 The drive through the park was filled with animals in their natural setting. In addition to this buffalo we saw prairie dogs, antelope, deer and wild horses. We hiked a bit along this ridge overlooking the Little Missouri River. It was breath taking. 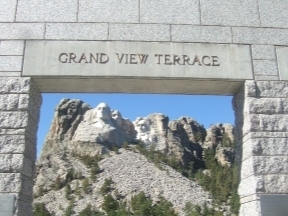 One of the many man-made wonders is that of Mount Rushmore in South Dakota. A must see! 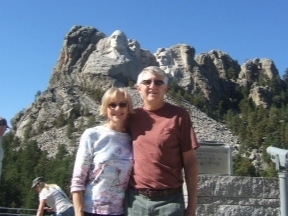 Here we are pictured with the head of four great presidents in the background. You don't see this every day. A wild burrow searching for food through the windows of cars driving by. Glorine was lucky she did not get her finger bit off as she held out an apple. This was taken in the Custer State Park in South Dakota. 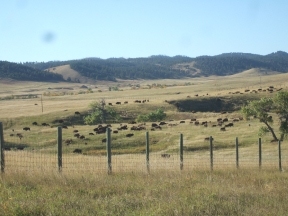 Here we are leaving Custer State Park where each year, they conduct a roundup of thousands of buffalos. 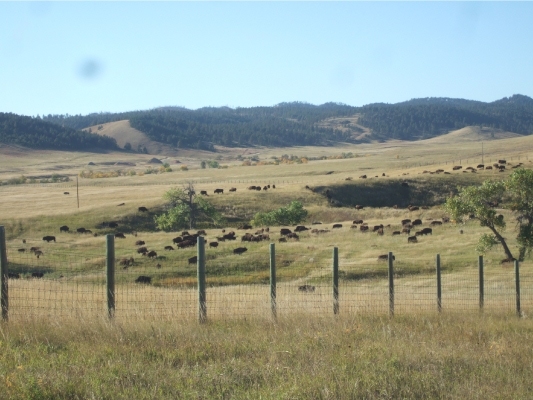 We missed it by a day but we were quite pleased to be able to capture this picture with a couple of hundred buffalo, once near extinction. 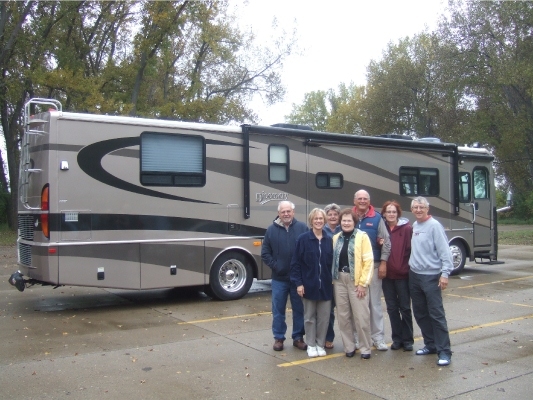 Along with the picturesque scenery we had the opportunity to visit with two of Glorine's nieces, Tammy and Cindy and her nephew Peter (all seated), along with their spouses, Jeff, Gary, Cheryl and us RVers. Cindy hosted this great get together at her home. Good food and lots of great fun. 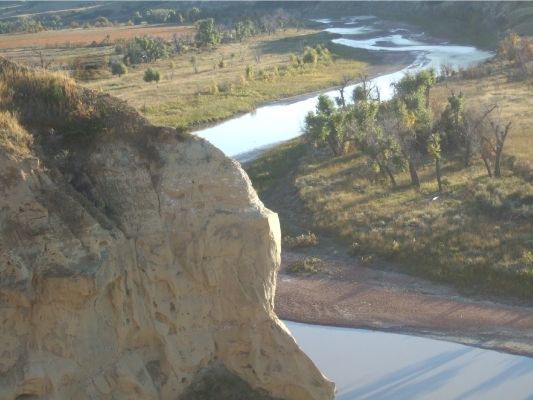 Near Rapid City is a small town called Hill City. 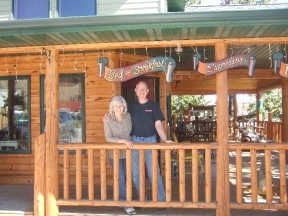 This is where Larry found another one of his first cousins, Linda and her husband Sam. They own this bed and breakfast with an espresso. Linda is a couple of years younger than Larry and both grew up on farms near one another west of Mandan. It had been nearly 40 years since we saw one another. Great coffee and a very nice visit. 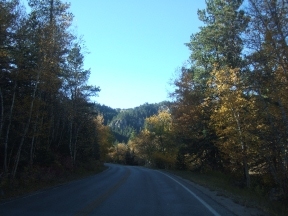 We hit the peak "fall foliage" season in the Black Hills. While most are evergreen trees, many along the roads were yellow, brown and a few bright red. This picture does not do justice to the beauty of the hill side as we drove through the many scenic byways and canyons of the Black Hills. Here along this scenic byway was Rough Rock Fall where we stopped for some hiking and picture taking with Wayne and Maureen in the foreground. A little slice of heaven. 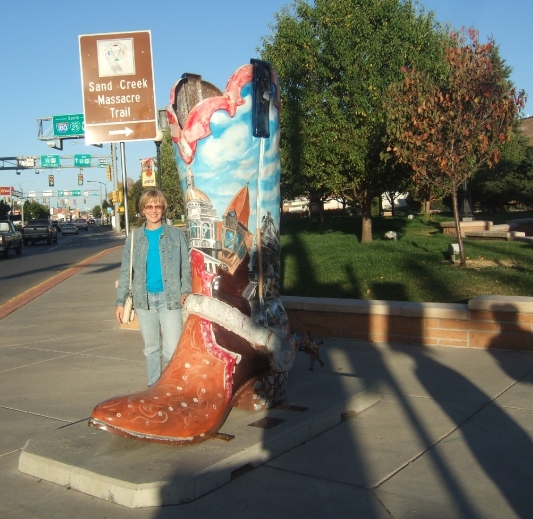 We ended September with a one night stop at an RV park near Cheyenne Wyoming. 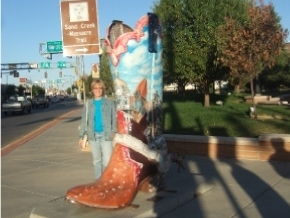 Here Glorine is pictured next to a cowboy boot twice her size. To say September was jam packed would be an understatement, but it was all fun--a great thing about Roaming through Retirement. And now on to October!! September's web page includes September 1 through September 30.